Black people crying for help from rooftops; left to drown, starve or die of dehydration or from lack of medical care—the whole world saw the U.S. capitalist governments murderous racist neglect in the social disaster that was Hurricane Katrina. Tens of thousands of people, most of them black, lost the little they had. The National Guard came not to provide relief but to criminalize the victims. At all levels, the government covered up the death toll and other evidence of its culpability. And it had all happened before. John M. Barrys Rising Tide: The Great Mississippi Flood of 1927 and How It Changed America (New York: Simon & Schuster, 1997) tells the story of another historic natural disaster and the governments cover-up, lies and neglect. Then as now, racist ruling-class callousness and violence sustained the U.S. capitalist order. The Great Mississippi Flood—actually a series of floods lasting several months—deluged 27,000 square miles in seven states. After months of torrential rain, levees burst from Illinois to Louisiana. An unknown number died—certainly in the thousands. Many were buried beneath tons of river mud or washed out into the Gulf of Mexico. Hundreds of thousands lost their homes; more than 325,000 people, most of them black, lived in Red Cross camps for as long as four months. The unique race and class nexus of the United States spawned the 1927 flood disaster. The Civil War—the second American Revolution—had broken the chains of chattel slavery. But with the defeat of Reconstruction, the most egalitarian period in American history, the old planter aristocracy regained power. The black freedmen were politically disenfranchised, and a social order based on debt servitude—sharecropping—was established. In the Deep South of the 1920s, the machine age had scarcely touched cotton production. Jim Crow segregation, buttressed by the terror of lynch law and the Ku Klux Klan nightriders, enforced sharecropping peonage under the wealthy Bourbon planters. The spirit of white supremacy infected the whole country. The degradation of Southern black labor served to drive down wages for all workers, while the poison of race-hate retarded the development of working-class consciousness North and South. Control of the wild waters of the Mississippi is key to the Gulf ports of Louisiana and to commercial river traffic. The river and its tributaries reach into more than 40 percent of the continental United States. As Barry documents in his book, the interests of the banks and planters determined flood control policies along the Mississippi. Barry also describes engineering decisions that led to the levee system, which only worsened the inevitable natural catastrophe. Richard Wrights powerful story, Down by the Riverside, captures the nightmare of the 1927 flood. The protagonist watches men wearily toiling on the levees and unloading boats while behind them stood soldiers with rifles. When the levee breaks, he sees the long lines of men merged into one whirling black mass. Wrights story describes the desperation and powerlessness of a black flood victim trying to save his family in a hostile world where whites are far more ominous than the awful forces of nature. The deluge swept away everything in its path. To prevent his tenants from fleeing the desolation, one planter locked them in barns and cotton gin houses. Black people who found shelter in public buildings were driven back into the waters at gunpoint. Thousands of flood victims fled to or were forcibly driven to the narrow crowns of the levees, bringing with them nothing but their debts to the planters. The Percy family, the main planters in Greenville, prevented blacks from boarding barges brought to evacuate the homeless masses for fear of losing their cheap labor force. In the Greenville area alone, 5,000 black people were forced to take shelter in warehouses, stores and similar facilities, while up to 13,000 more lived on an eight-mile-long levee. 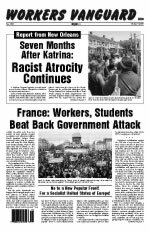 In New Orleans, with its crucial banks and port facilities, newspapers refused to print flood warnings even as the waters mounted for fear of touching off panic among investors. The state and city ruling-class elite ordered the dynamiting of the levee protecting St. Bernard and Plaquemines parishes to the south of the city to create the illusion that they were doing something to save the city and its port. Some 10,000 impoverished people—mainly trappers, fishermen and bootleggers—were displaced, and few ever got more than a few dollars of compensation. The federal government didnt contribute a dime of direct aid to the thousands of flood victims, despite a record budget surplus. The Red Cross established racially segregated camps in the flood zones. Black families lived in floorless tents in the mud without cots, chairs or utensils, eating inferior rationed food. Sometimes forced to work on the levees without pay, black men had to wear tags identifying that they were laborers in order to receive rations, and to show which plantation they belonged to. Women with no working husband did not get supplies unless they had a letter from a white man. Policing the camps, the National Guard supervised the workers, whipping and beating the men. At least one black woman was gang-raped and killed by Guardsmen. Typhoid, measles, mumps, malaria and venereal diseases ran rampant among destitute tenant farmers and mill workers already weakened from illnesses endemic to poverty, such as tuberculosis and pellagra. The Chicago Defender (4 June 1927) even reported that those who die are cut open, filled with sand then tossed into the Mississippi River. Such horrors were stark proof that the poisonous legacy of chattel slavery still infected the land some 60 years after the Civil War. The 1920s in the United States was a period of untrammeled capitalist greed, when anti-black racism and anti-immigrant bigotry reigned and a weak, craft-based labor movement meant that few workers were organized into unions. Government repression was fueled in part by fear that the 1917 Bolshevik Revolution would inspire U.S. workers. Sacco and Vanzetti, immigrant anarchists framed up for bank robbery and murder in Massachusetts, were executed in August 1927 despite massive, worldwide protests. In the South, the KKK-infested Democratic Party ran the government. In the North, the Klan had hundreds of thousands of members from Portland, Maine to Portland, Oregon, running state and city governments. In the midst of the 1927 floods, a wave of lynchings hit the South. In Little Rock, a black man was hung from a tree and riddled with bullets. His corpse was then tied to the back of a car, dragged through the town and burned. In Mississippi, two black men were burned at the stake. But black people fought back after the murder of James Gooden in Greenville that July. A cop had ordered Gooden to join yet another work gang after he had worked all night. When he refused, the cop killed him. Blacks, seething with anger, stopped work on the levees. They began carrying firearms along with their shovels, hoes and knives. Like virtually every white man since Reconstruction who had killed a black man in Mississippi, the cop was never indicted. The county prosecutor was the Exalted Cyclops of the Klan. The scale of the Great Flood was such that it contributed to the breakdown of the Southern sharecropping plantation system, as those fleeing the ravaged Delta accelerated the Great Migration of Southern blacks to Northern industrial cities like Chicago. During World War II, black migration from the South was boosted yet again, as labor was needed for defense industries. The Great Migration changed the composition of the U.S. working class and the labor movement, particularly as black workers joined the new industrial unions in the 1930s and 40s. Over time, as industry increased in the South, poor agrarian whites as well as blacks were proletarianized, creating an identity of interest between them. Such changes in the South created the conditions for the re-emergence of the struggle for black freedom. The mass civil rights struggles of the 1950s and 60s finally resulted in the clearing away of the legal framework of segregation in the South. But while Jim Crow was the most blatant form of institutionalized racism in this society, the root of black oppression remains in the structural workings of the U.S. capitalist profit system, as the 2005 Gulf Coast disaster so dramatically exposed. The sharecropping system may be gone, but by every measure of social conditions—the huge prison population, unemployment, non-existent health care and prison-like schools—black people remain an oppressed race-color caste segregated at the bottom of U.S. society. At the same time, black workers continue to be integrated into strategic sectors of the industrial proletariat, which alone has the power to shatter this racist capitalist system. Won to a revolutionary program, black workers will be the living link fusing the anger of the dispossessed ghetto masses with the social power of the multiracial proletariat under the leadership of a Leninist vanguard party. No to a New Popular Front! For the Right of Independence for Puerto Rico! Down with FBI Repression Against Puerto Rican Militants! Labor: Protest Jail Sentence for TWU President Roger Toussaint! "We All Gave, but We Received Nothing"